Towards the end of 2005, CANA (Christian Arts Networking Association) held a small international arts conference on the island of Bali. This event was special to me for a number of reasons. It was the third time I had been to Bali for a conference, and my first time as director of the arts organization. We were holding this conference in the shadow of a recent terrorist bombing. Many tourists were leaving. I think the local people were glad to see us. 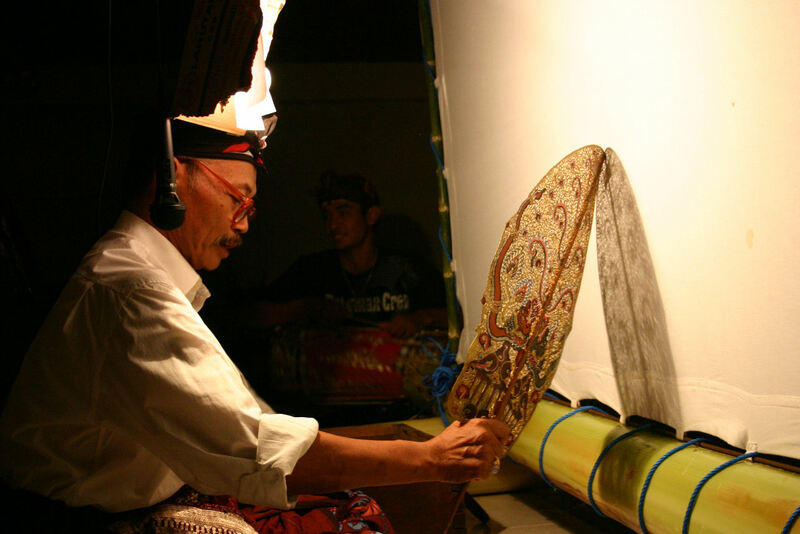 I had been in Bali earlier that year and asked artist, dancer, and puppet master Nyoman Darsane to prepare and perform a Balinese shadow play for us, using traditional elements in combination with contemporary dance by Tina Bailey. I wanted them to tell some stories chosen from one of the Gospels. The Balinese shadow play (Wayang Kulit) is one of the principal art forms that ties together the entire Balinese worldview, linking cosmology, society and individual person. The puppet master pulls from a repertoire of traditional tales and retells them with an emphasis on contemporary moral and spiritual lessons. The art form itself is believed to embody an underlying spirituality that some say is more ‘real’ than the audience watching. Because of the complex of spiritual and artistic issues woven through the layers of the Balinese shadow play, I felt it was an appropriate vehicle for stories about the author, sustainer and redeemer of all created reality, Jesus Christ. I also felt the lessons woven into these chosen stories had much to teach us. I had picked three stories from the Gospel of John. All of the chosen stories referred to ‘feet’. In one story Mary was anointing the feet of Jesus with perfume. In another Jesus was washing the feet of the disciples. In the third story Judas leaves the upper room and hurries away to betray Jesus to the authorities. I wanted these stories performed as part of our conference communion service so that we, as artists, might later reflect on their message. I wanted us to remember that beautiful actions, like the one in which Mary anointed the feet of Jesus, have their place in the life of the church. Lessons about hospitality and service are concentrated in the foot-washing story. What can they mean for us? Judas’ mindset is a dangerous one. He voiced a public criticism of Mary’s ‘extravagance’ and then used the occasion to promote himself as truly socially concerned. Some days later Judas embarked upon his final act of betrayal. However, as I am coming to realize, it is not simply outright betrayal that is a problem. On a more recent visit to Cambodia I spent some time at the Metta Karuna reflection centre in Siem Reap. Here I saw an image that also had much to teach me. On the grounds of this center were a series of sculptures. One in particular showed a man kneeling to wash the feet of another man, discovering that the intended recipient of his service had lost his foot by stepping on an unexploded landmine. This piece, entitled `I have no foot to wash’ was a stark reminder that sometimes there is a gap between our very best intentions and the actual needs of the people that we say we want to serve. Steve Scott (MA Global Leadership Fuller Seminary 2009) is the director of CANA (Christian Artist Networking Association). His two books on art theory are Crying for a Vision and Like a House on Fire. His most recent album is Emotional Tourist: A Steve Scott Retrospective. See http://cana-arts.blogspot.nl and e-mail Steve at info.cana.arts@gmail.com. Photo 1, 2 and 3 © Jonathan Bailey. Photo 4 © Steve Scott.